Mercedes House 550 West 54th Street, Manhattan TEN Arquitectos Archtober-ites probably expected to enviously gawk at the views and wander through the wedge-shaped, amenity-filled, courtyards of Mercedes House, one of the recent luxury rental additions to Midtown West. What they probably didn’t expect was TEN Arquitectos partner Andrea Steele’s eloquent and educational lesson on the challenges and opportunities of zoning in New York. Standing around a model of the finished project, she outlined the slightly tired and trite as-of-right development schemes that the site offered: a courtyard “donut” or a low podium base topped by two residential towers. Rather than settle for these stale alternatives, TEN Arquitectos, with the support from the client (and Heritage Ball honoree) Two Trees, embraced and questioned the zoning constraints to propose a solution that, in their eyes, better aligned with the original intention of the codes (and resulted 20 percent inclusionary housing to boot). The result: a stepped, Z-shaped slope, rising first to 86 feet as it moves away from DeWitt Clinton Park at 11th Avenue and then to 328 feet as it reaches the heights of 10th Avenue. The move, while dramatic, does not merely register as a formal gesture – it resolved problems. The incline reconciles the disparity of scales between the two avenues. And pulling the massing away from the street created a thinned-out floor plate “corridor” (the Z’s long diagonal) that maximizes light for tenants and pedestrians alike. A low base provides storefronts for micro-retail, allowing Mercedes House to grow roots in its neighborhood. Despite being a private residential project, creating civically-minded projects is paramount to TEN Arquitectos. Nevertheless, luxury residential is luxury residential, and this means amenities: pools, bocce courts, and even an outdoor cinema grace the courtyards. But who needs giant projection screens when you have views like those at Mercedes House? 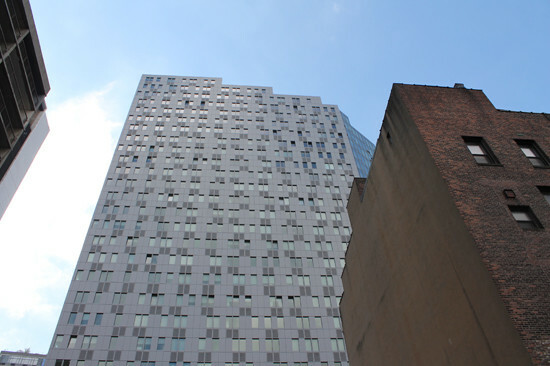 Steele put it best: “Everything you do, juxtaposed with the skyline of New York, is just better.” And speaking of views, what about the endless comparisons to its neighbor to the north, Bjarke Ingels’ VIA at West 57th Street? One participant was even bold enough to ask if Mercedes House is driving change in the zoning process. Steele responded by encouraging all architects to propose innovative solutions to enhance the public realm. But in the words of one participant, an Aspen-based, Brooklyn-born architect, “I like this one better. 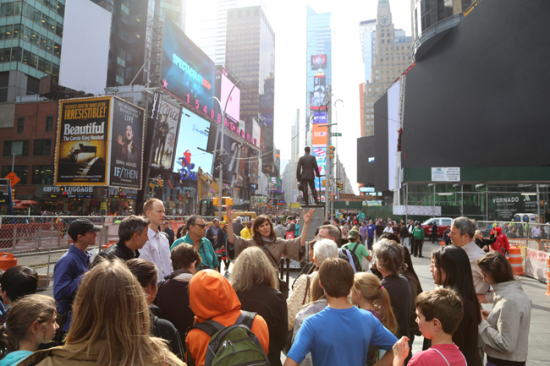 It’s a very liveable project.” Camila Schaulsohn is communications director and editor-in-chief of e-Oculus. Brooklyn Botanic Garden Entry Building, Arch, and Steinberg Visitor Center 990 Washington Avenue, Brooklyn WEISS/MANFREDI, Architecture Research Office With blue skies overhead and abundant sunshine, it was the perfect day to funnel from Brooklyn's clamorous urban streetscape into the transportative, protected landscapes of the Brooklyn Botanic Garden. On this double-header Building of Day tour, Archtober-ites explored the threshold from the city grid into the meandering, arboreal pathways at the garden, as experienced in two new entrance pavilions designed by WEISS/MANFREDI and ARO. 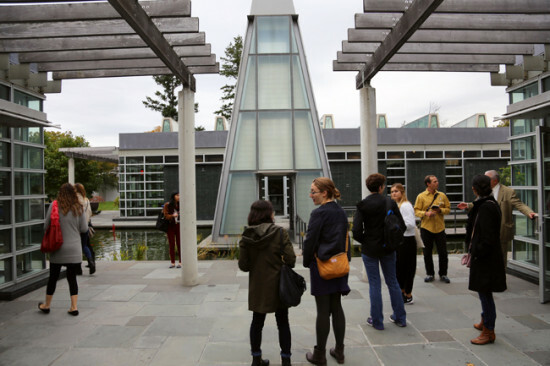 The tour began at the northern entrance of the Brooklyn Botanic Garden, where WEISS/MANFREDI’s Steinberg Visitor Center pulls visitors in off of the busy Washington Avenue. Bound on one end by a gently curving glass wall that suggests the S-shape of the building, WEISS/MANFREDI’s visitor center at once announces itself as an architectural presence on the street, but also diminishes its imposition on the landscape in deference to the gardens that lay behind it. Guides Paul Duston-Munoz and Evelyn Rosado from WEISS/MANFREDI described this delicate balance between presence and deference that dictated the siting and form of the visitor center. The building, which houses a ticket counter, visitor information services, gift shop, offices, and an event space, is clad in a glass curtain wall with an exterior glass trellis. As you walk through the space, natural light falls in a rhythmic pattern through the trellis, echoing the experience of light filtering through an arbor of trees. The architects conceived of an S-shape for the building, emulating the existing meandering pathways of the gardens and allowing for a separation between the public entry portal in front and the event space in back. The event space—the largest two-walled room in New York—is encased by the trellised-glass curtain wall on one end, overlooking the Japanese Garden, opposite a wood-paneled wall, partially constructed from the three Gingko trees that had to be removed from the site. The S-shape of the building also means that the entire structure would not be visible from any one vantage point, so as not to overwhelm the garden setting. Atop the visitor center, a green roof planted with tall, flowering grasses in varying heights and shades of green provides a harmonious bridge between the architectural threshold and the verdant landscape beyond. 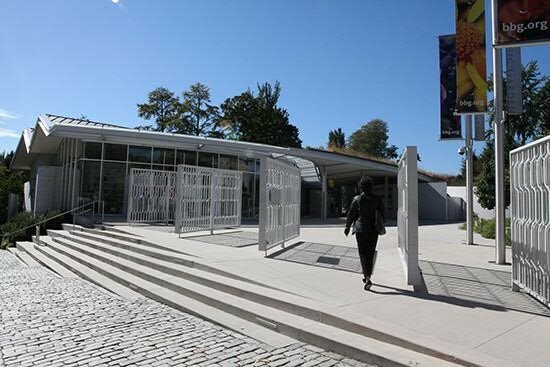 On the southern end of the Brooklyn Botanic Garden, ARO designed a new ticketing and bathroom facility to reactivate an underutilized access point to the gardens. Kai Pedersen of ARO, explained how the siting of the new pavilion was meant to act as both a barrier between the noisy intersection just beyond the garden, and as a welcoming invitation to the community to enter the gardens. The slender brick building topped with a geometric zinc roof and a cantilevered awning is in dialogue with a historic Beaux-Arts archway entrance designed by McKim, Mead, & White from the 1920s, which ARO is in the process of restoring. ARO’s new entrance building has bold architectural elements, while maintaining deference to both the botanic setting and the historic context. The new building uses brick patterning inspired by McKim, Mead, & White’s arch. Pedersen described the infrared film inserted into the layered glass that partially visible to the human eye, but clearly visible to birds, intended to protect avian visitors to the gardens. The two new entryways to the Brooklyn Botanic Garden provided seamless transitions between the urban context and the calming respite of the diverse flora housed in the gardens. 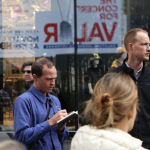 Alex Tell is the committee's coordinator for the AIANY | Center for Architecture. 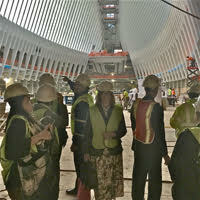 World Trade Center Transportation Hub World Trade Center, Manhattan Downtown Design Partnership; STV, AECOM, and Santiago Calatrava A team from the Port Authority of New York & New Jersey wowed the crowd of lucky Archtober fans this morning with a full-length tour from the Hudson River to the beating heart of the new World Trade Center. Robert Eisenstat, the chief architect at the Port Authority Engineering Department, was joined by Thomas L. Grassi, a program manager on the World Trade Center construction, and a number of others along for the ride. These dedicated people, along with many others, have been working on the site since “the day.” Today was a little reminiscent of that day, over 14 years ago—a crisp sunny day with only wisps of clouds. It is hard to visit the site at all, for some of us. 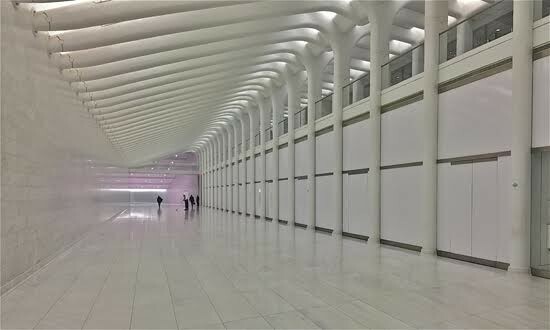 But now because of the sublime poetry of the World Trade Center Transportation Hub—they call it the “oculus”—a brighter future can be imagined. It is a futuristic creature born from the construction chaos that still defines the neighborhood, with white, spiked ribs rising up like the barbs of a chalky peace dove’s feather. Peace is not easy. I kept thinking, we have to tell the crowd how complicated this all was, how many levels, how many logistical nightmares, how many times its seemed like it could never be completed. I have to do my thing about how architects are problem solvers, which of course is true. But some problems are spiritual ones, hard to put in the brief for a nearly $4 billion transit integration project. This is where the architect’s special poetry comes in. Whatever you may say about this project, and there has been a lot of negative press with Santiago Calatrava certainly taking some knocks along the way, it is uplifting. The spirit soars; the room has an ineffable majesty of great architecture that defies easy explanation. While the Port Authority was getting its “network cohesion” out of the tangle of subway lines and trans-Hudson modalities, it also got a cathedral that looks like the waiting room for heaven. Cynthia Phifer Kracauer is the managing director of the Center for Architecture and the festival director for Archtober: Architecture & Design Month NYC. She was previously a partner at Butler Rogers Baskett, and from 1989–2005 at Swanke Hayden Connell. After graduating from Princeton (AB 1975, M.Arch 1979) she worked for Philip Johnson, held faculty appointments at the University of Virginia, NJIT, and her alma mater. Tomorrow: Brooklyn Botanic Garden Visitor Center, Entry Building, and Arch. It makes sense that one of New York City's exceptional botanical gardens would develop what would become one of the city's first green buildings. What is extraordinary is that the Queens Botanical Garden (QBG) began its new Visitor and Administration Building in 2000 – the year LEED certification was launched – and achieved LEED Platinum for a building that ambitiously demonstrates what designed harmony between buildings and nature can be. Patrice Kleinberg, garden educator for the QBG, and Joan Krevlin, FAIA, LEED AP BD+C, partner at BKSK Architects, led today’s tour, providing perspectives on both the garden’s unique public engagement challenges and the design solutions. At the earliest stages of the project, the QBG engaged the community to find out what would serve them; across all sectors, they heard “water.” What subsequently evolved was a series of water systems that were both experiential and functional – the building houses not only administrative operations and diverse public programming, but also collects, conserves, cleans, and recycles water. Three different sustainable roofs serve different purposes. 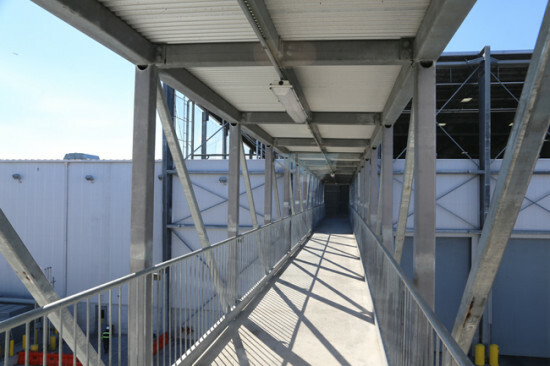 The main structure hosts a solar-powered roof, which generates enough power for about 20% of the building’s operations. The roof of the auditorium is planted with local species, cooling the building. 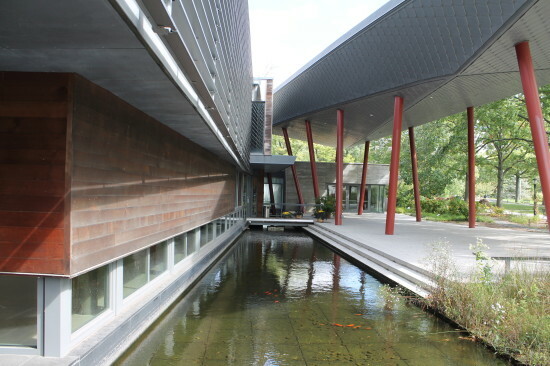 The forecourt’s soaring roof canopy, which provides a shady transition space between the gardens and the interior, doubles as a rainwater collection unit. The water collected by the canopy is stored in a subterranean 26,000-gallon cistern that is pumped up into the Fountain of Life, which leads to a leafy stream and eventually into a moving body of water that is terraced between the buildings and culminates in a moat-like pond. The Visitor and Administration Building also sustains a grey water system, wherein water from sinks, toilets, dishwashers, and showers moves through a sandy, planted biotope, from which it can be repurposed. These innovations have inspired and expanded the QBG’s educational offerings, engendering green cleaning job training, and leading to the development of new K-12 curricula. Importantly, the project's bioswales have greatly decreased storm run-off in the area’s sewage systems. Tomorrow, we’ll head over to the World Trade Center Transportation Hub. 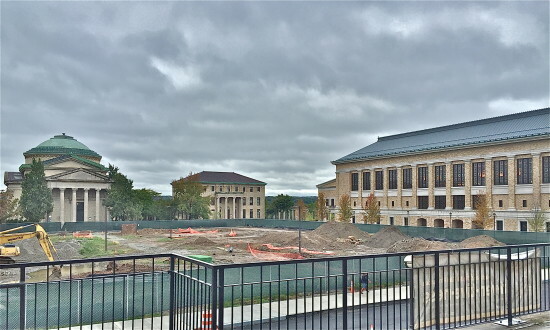 Archtober Building of the Day #3 North Hall and Library, Bronx Community College Robert A.M. Stern Architects Alex Lamis, FAIA, and Dennis Sagiev met a windblown gaggle of enthusiasts on the educational plateau of the Bronx: the former University Heights campus of NYU. Now Bronx Community College, it is a repository of ambitious plans. The first was the Jeffersonian campus plan of 1892 by Stanford White with its iconic Gould Memorial Library (1900) framed by the venerable Hall of Fame (1912). Marcel Breuer made his Modernist marks on the hilltop in 1956 and on into the 1960s. At North Hall it’s all about respect. The gang at Robert A. M. Stern Architects went straight to fitting in alongside the White masterpieces. 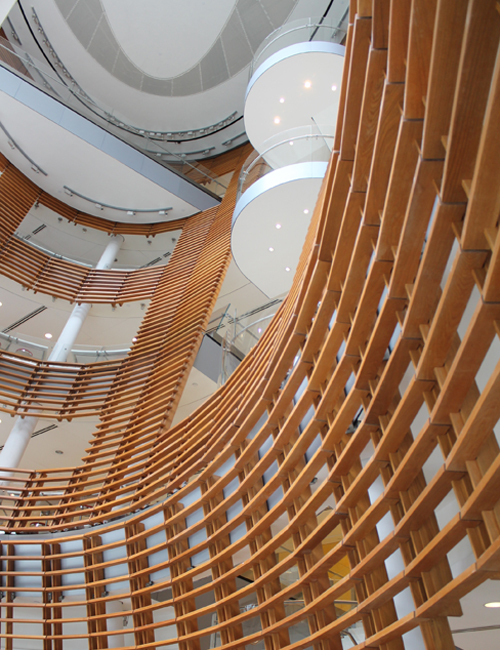 The library itself is sturdily traditional in its up-to-the-minute technology hub – the information commons is awash with stand-up computer desks with scrolls. “A pent-up need,” according to librarian Theresa McManus, resulted in a project that “sends a message to the students.” There’s new building technology in the panel precast brick construction. And RAMSA designed an ironic postmodern histri-ionic column. Lamis explained that the fake rivets were part of the “artistic representation” of the structural steel. Historically, Lamis noted, the library is a “center for the retention of culture in its place.” Tomorrow’s excursion is to the Queens Botanic Garden. 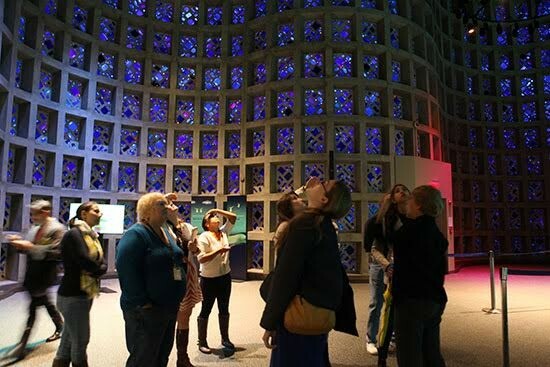 Intrepid Archtober-ites ventured to the site of the 1964-65 World’s Fair to explore a monument of the Space Age. The New York Hall of Science, a 90-foot-high undulating vertical structure designed by Wallace K. Harrison, was meant to create the illusion of floating in deep space. Cobalt glass shards stud the 5,400 coffers in the rippling wall, filtering sunlight into the interior and bathing it in an intense, blue glow. Ennead Architects associate Theresa O’Leary gave a detailed account of the extensive renovations that were made in preparation for the 50th anniversary of the World’s Fair . Together with Building Conservation Associates, the firm carefully surveyed the entirety of the structure and made repairs to the water-damaged concrete and rusted rebar. Biogrowth and atmospheric soiling, accumulated over the years, were cleaned off. 50 glass panels were replaced. While the renovation of the building is complete, the exterior landscaping is still a work in progress. Due to a history of drainage issues, plans to recreate the original hexagonal pool were scrapped in favor of greenery. Ennead is also working on an outdoor classroom for the school groups that visit the museum. We’ve moved past the Space Race, but the freshly scrubbed Hall of Science stands as a proud testament to its time. Archtober Building of the Day #31 Starlight at the Museum of the City of New York 1220 Fifth Avenue Cooper Joseph Studio Starlight, the aptly named chandelier in the neo-Georgian rotunda of the Museum of the City of New York, was a marvelous termination to our fourth Archtober. 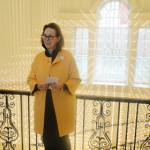 Wendy Evans Joseph, principal at Cooper Joseph Studio, described the light fixture with meticulousness equal to the design itself. 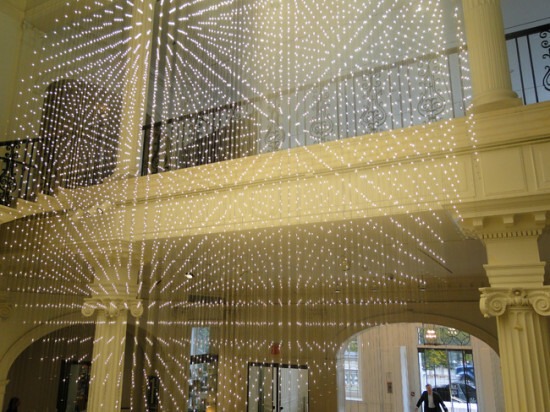 Fifteen feet in diameter, the display is a three dimensional grid of paired LED lenses fixed within three wires and suspended from the ceiling. The visual effects are stunning, ranging from infinite reflected vistas of tiny lights, to starbursts, and pixelated moire patterns. Executive Director Susan Henshaw Jones joined the tour and called the piece “the most successful thing ever!” and “everybody’s favorite thing!” Demonstrating the extraordinary craft of Studio 1 Thousand and RUSHdesign, Starlight provides a dynamic experience enhancing the trip up the swell old marble stair. It received a 2014 AIA New York Chapter Design Award in the catch-all “Projects” category. So Archtober 4 comes to a close, and the ghosts and ghouls have mustered down here in Greenwich Village for the after the annual Halloween parade. See you next year! Archtober Building of the Day #30 Sunset Park Material Recovery Facility 472 2nd Avenue, 29th Street Pier, Brooklyn Selldorf Architects Eadaoin Quinn, the education and administrative coordinator at the SIMS Municipal Recycling Facility presented a classroom full of Archtober enthusiasts with a detailed and informative presentation of the automated process of material sorting and recovery that is recycling. Quinn told us about the machinery of sorting, starting with the “liberator shredder,” which opens the large garbage bags that recyclables arrive in by truck or barge. Each step of the almost entirely automated process has a purpose-built system of conveyor belts and sorting machines that transform bags of trash into re-sellable bales of like material. The sorting processes themselves are interesting: the Ballistic Separator is comprised of rotating planes that push flat plastic bags up an inclined plane while, at the same time, glass is broken and sent downward to another conveyor. The Eddy Current separator can distinguish between ferrous and non-ferrous metals. Optical sorters can “see” what kind of plastic is passing by on the belt, and signal a puffer to blow the lighter material out of the line onto another conveyor. Today was cleaning day, so we did not get to see all of these machines in action. But we did see 400 tons of trash waiting to make its way into the process. Selldorf Architects received an AIANY 2014 Merit Award in Architecture for the structure that houses the piles of trash and the machines that sort and bale them. The Design Awards jury stated: “Extraordinary project. Not many people are capable of recognizing how construction to cover garbage can be nice.” Alas, none of the building’s architects attended the tour. Too bad, because it was a spectacular day out there on the Gowanus waterfront. There was a good sized crowd, and a couple of really smart kids asking intelligent questions. Archtober Building of the Day #29 Green-Wood Cemetery Columbarium, Tranquility Gardens, and Chapel/Crematorium 500 25th Street, Brooklyn PBDW Architects The trend in burial at Green-Wood Cemetery is decidedly toward cremation. Built in 1838, and the final resting place of 570,000 people, it is “literally running out of space,” according to Green-Wood President Richard J. Moylan. He estimated they’ll run out of space for in-ground burials in the next five years. “We could pack them in tighter, but that would ruin it,” he said. Anne Holford-Smith said her firm consulted a feng shui expert when designing the gardens and columbarium. “To make sure we don’t commit too many sins,” explained Moylan. The “qi” flows well through the garden, which is dominated by a shallow pond, complete with koi fish. A footbridge over the pond supports a striking glass obelisk whose interior offers a place for contemplation. The path leads to the columbarium, Latin for dovecote, a building filled with niches to house urns of cremated remains. “We really fell in love with the glass,” said Holford-Smith, explaining the dominant motif of the horseshoe-shaped columbarium that circles one end of the pond. PBDW wanted to bring “the outside inside, and the inside outside,” she said. Although they are somber and richly textured, the rooms have an airy openness, with floor-to-ceiling windows showcasing the rolling hills of the old-fashioned cemetery beyond. 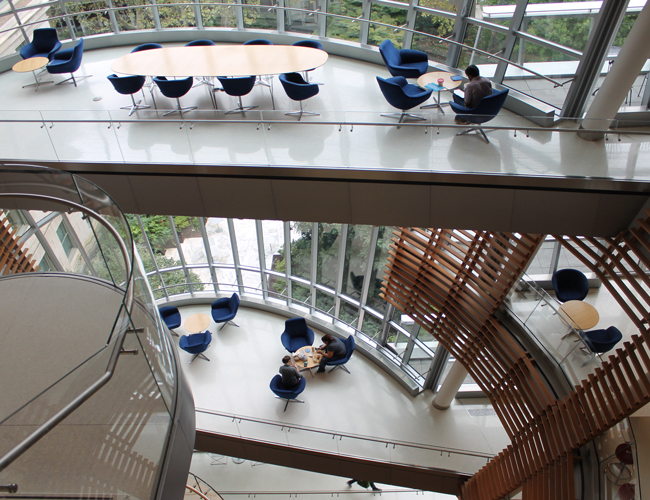 Intimate spaces have curved walls of niches and discrete seating areas with upholstered furniture and soft carpeting. Orchids sit on coffee tables. The only sound is the rushing of air. PBDW worked in several different materials, which Green-Wood offers at different price-points for its “niche” customers. Transparent glass is the most popular, followed by opaque granite. Frosted glass is not a big seller, and no one seems to want the wooden niches with folding doors and little locking compartments. Apparently the columbarium’s customers want their jade urns, complete with small pictures of their deceased loved ones, visible to all passersby. Moylan explained that niches at eye- or heart-level are the most expensive. “It’s all location, location, location,” he said. 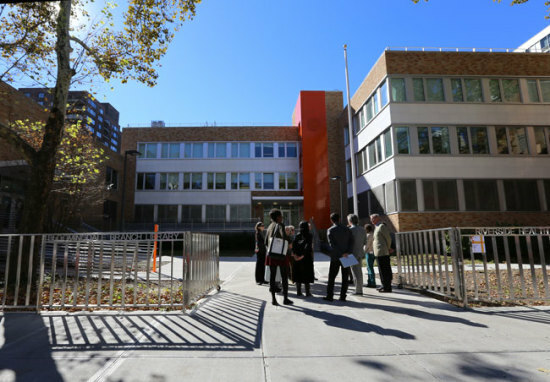 Archtober Building of the Day #27 Riverside Health Center 160 West 100th Street 1100 Architect Among my favorite things about Archtober are the enthusiasts who show up and add color and detail to the architects' stories about their projects. Today, in addition to a solid performance by 1100 Architect’s Juergen Riehm and Dominic Griffin, we were amply blessed with a number of locals, or, as Winifred Armstrong self-described, “camp followers.” Sally Yap of the Department of Health and Mental Hygiene also supplemented our understanding of this new renovation project. The Riverside Health Center, originally designed in 1960 by Harry M. Prince, Architect and opened in 1964, is a handsome, three-story brick and terra-cotta building with aluminum strip windows that is among several civic buildings built in the superblocks created by Robert Moses’ post-war slum clearance on the Upper West Side. It doesn’t even seem like Manhattan up there, between the vast parking lots, the ample playgrounds, small scale civic buildings, and the swath of towers in the park—some notably designed by Skidmore, Owings & Merrill in the 1950s for William Zeckendorf. The building houses the educational component of the city’s food safety program, a sexually transmitted diseases clinic, community facilities, and offices. A bright orange terra cotta-clad corner marks the entrance, and it turns out that it is a Percent for Art installation by artist Richard Artschwager. It’s on the inside, too, adding additional color to an already cheerful interior stair. Both of the interior stairs have been fancied up to entice people to lower their blood pressure by eschewing the elevators. Glazed brick, vertically oriented in bright shades of mango and yellow, makes the stairs positively delightful—and even visible through the two-hour-rated fire glass doors. Active Design takes center stage! 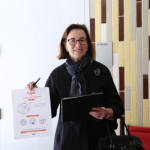 Cynthia Phifer Kracauer, AIA, is the Managing Director of the Center for Architecture and the festival director for Archtober: Architecture and Design Month NYC. She was previously a partner at Butler Rogers Baskett, and from 1989-2005 at Swanke Hayden Connell. After graduating from Princeton (AB 1975, M.Arch 1979) she worked for Philip Johnson, held faculty appointments at the University of Virginia, NJIT, and her alma mater.